Rutgers University Press, 9780813576213, 328pp. “A vibrant, engaging account of the women who preceded and followed Rachel Carson’s efforts to promote environmental and human health. In exquisite detail, Musil narrates the brilliant careers and efforts of pioneering women from the 1850s onward to preserve nature and maintain a healthy environment. Anyone interested in women naturalists, activists, and feminist environmental history will welcome this compelling, beautifully-written book.” —Carolyn Merchant, author of The Death of Nature and professor of environmental history, philosophy, and ethics, University of California, Berkeley. ROBERT K. MUSIL is President and CEO of The Rachel Carson Council, Inc., senior fellow at the Center for Congressional and Presidential Studies, American University in Washington, D.C., and author of Hope for a Heated Planet. He is the former CEO of the Nobel Peace Prize–winning Physicians for Social Responsibility and an award-winning journalist. "Musil uses the life and writings of Rachel Carson as an exemplar of women's participation in the American environmental movement. He places Carson's achievements in contexts by illuminating...the lives of trailblazing female scientists who inspired her and for whom she, in turn, paved the way. Extremely well-researched." "An eloquent and moving tribute to the women at the heart and soul of the environmental movement. It is a story of brilliant science, courage, stamina, and a passion for life. We are in debt beyond counting to them and to Robert Musil for telling their stories so well." "This is a long overdue book, giving great credit to the long line of women who have done so much to shape our culture's view of the world around us and of our prospects in it. We desperately need that culture to heed their words!" "A vibrant, engaging account of the women who preceded and followed Rachel Carson’s efforts to promote environmental and human health. In exquisite detail, Musil narrates the brilliant careers and efforts of pioneering women from the 1850s onward to preserve nature and maintain a healthy environment. Anyone interested in women naturalists, activists, and feminist environmental history will welcome this compelling, beautifully-written book." "Bob Musil brilliantly documents the rich trajectory of women’s intellectual and political influence, not just on environmentalism but on public policy and activism. Musil offers fascinating details of Rachel Carson’s struggles to be taken seriously as a scientist and unearths the stories of the women—unsung heroes all—who influenced her. A must read for anyone interested in American history, science and environmental politics." "A treasure! A welcome discovery of the linkages among profoundly caring, ecologically-aware women across time, and the truths of our ecological crisis. Musil shows clear-eyed science and heartfelt story-telling are not mutually exclusive." "Bob Musil provides an important contribution to the history of the environmental movement. He paints a compelling portrait of Rachel Carson and the remarkable women who preceded her and who continue her legacy. He reminds us of the struggles and achievements of Ms. Carson and, just as significantly, the pivotal and courageous role that women have played in fighting for a safer and healthier world." "With deep grounding in women's history, environmentalism, and public health—and, just as importantly, with great reverence—Musil introduces us to a pantheon of remarkable women, true heroines every one. This book offers a new perspective, countless wonderful stories, and inspiration. A great read!" "This book is one-of-a-kind. Musil provides a remarkable new perspective on the role of individual women in the US environmental movement." "An absolutely wonderful book! Bob Musil shows Rachel Carson not as a lone voice, but an eloquent one who drew inspiration from female predecessors and those around her. He argues persuasively that we can understand Carson better if we see her in relation to other women, to the broader environmental movement, and to working in community. Should be required reading for anyone interested in where we have been, and where we need to go." "Rachel Carson is only the best-known example amidst an inspiring cast of pioneering and modern women environmental leaders that Musil brings to life. Readable, reliable, and rousing—a book for anyone who cares about America’s past and future." 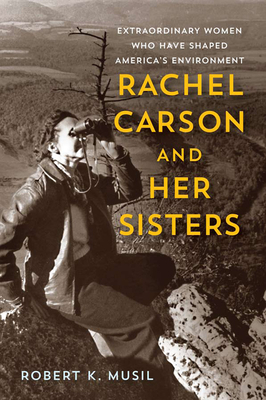 "In Rachel Carson and Her Sisters,Musil fills the gap by placing Carson's achievements in a wider context, weaving connections from the past through the present. Readers will find new insight into Carson and contemporary figures she influenced...who have historically received less attention. Musil's respect and enthusiasm for these women is evident throughout the book, making it a deeply engaging and enjoyable read. A valuable addition to scholarship on Rachel Carson, female environmentalists, and the American environmental movement in general.Highly recommended. All academic and general readers."